Do you want dependable and affordable roofing in Meraux, LA? For reliable roofing, you can call on ECO Commercial Roofing at (833) 200-0571 to save the day! Our professional roofing contractors are talented at providing superior roofing services, but we’re specialists in customer satisfaction. We have been business and residential roofers in the Meraux area for years, and our contractors are proud members of this community. Our contractors are extremely knowledgeable on the various types of roofing, and we’re glad to help you with any of your roof questions or concerns. Anytime you’re looking for a smarter roof experience, call the professionals at ECO Commercial Roofing for help. A vital asset to any commercial or house service is a reliable and trustworthy contractor. Each of our roofers goes through training to industry standards, and we are sure to only use high quality products from suppliers such as Conklin. Since the type of roof you install can alter the value of your property for years to come, we are sure to stock large selections of materials and styles for you to choose from. When picking, keep in mind that while the style plays a significant role, that the long term benefits also need careful consideration. The type of roofing you pick will ultimately rely on your budget, as well as the type of building you are needing to protect. There are tons of roof options to pick from, and our team is happy to help you out. We are happy to help you with any and all of your roof requirements, from replacements to installations, and anything in between. No matter which kind of roofing project you want, from commercial, to residential, or even industrial, we have the services you need. When you own a business property with a traditional style roof system, our commercial services may be the services best suited for your needs. Flat roofs need a certain degree of skill in order to ensure the longevity of your system, and enduring resistance to moisture, protection from ponding. If you’re interested in industrial roofing, we have the ideal materials and skill set for industrial facilities, and we can help you get a roof that will last for decades. For homeowners, we also have a variety of cost-effective residential roofing styles that are sure to fit your needs! As contractors that specialize in roof restoration, we understand more than a few techniques to work with roof coatings. From experience, we do assure you that we only use top quality products such as Conklin, as this ensures our roof coatings are dependable and resilient. In order to provide top of the line roofing in Meraux, LA, our crew works diligently to provide incomparable client satisfaction, with the assistance of detailed craftsmanship and experience. If you are interested in learning additional information about how roof restoration with Conklin products can prolong the longevity of your roofing system, give us a call now at (833) 200-0571, or look into the links below! Roof restoration is a superb way to improve the overall surface of your roof, while also preventing future damage. Correctly done, one of our Conklin roof restorations can provide an extra 10 years to the life of your roofing! If you pick a roof restoration service instead of a roofing replacement, you’ll get savings in your time and money! 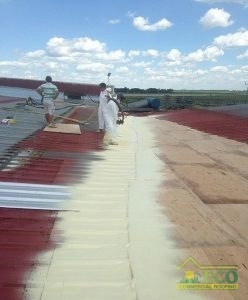 Our roofers generally perform our roof restoration with quality roof coatings by Conklin. You can depend on our contractors to help you determine which of our many roof coating options will work ideally for your requirements. Various coatings provide varying levels of adhesion, flexibility, and water resistance. Due to the specialized design, your roof coating will likely be applied right over the previous roofing system. To discover more, call our team today at (833) 200-0571! Acrylic Roofing Alternating temperatures call for reliable roof coatings such as acrylic, which are quite flexible. 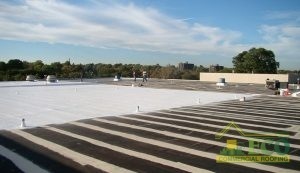 Among the many types of commercial roofs we can service, are low slope roofs as well as flat roofs. If you are looking to avoid issues with your roof, it is critical to start with a top quality installation. Our flat roof solutions are designed to outlast the competition, and deliver quality protection for your building. Residential and commercial roofing services from ECO Commercial Roofing are reliable and cost-effective. You can find our expert services and dependable roofing in Meraux, LA, along with in the nearby cities. An investment in a fortified roof is an investment in your business that you won’t regret! To find out how we can serve you best, give us a ring at (833) 200-0571 and set up your professional roofing assessment now!